I expect the occasional reader is going to look at this post and say “Huh?”, shake their head, and move on, but I am pretty excited about the outcome of this latest eco print. I have been toying with mixing naturally dyed cloth with eco-printing. There have been some disasters and disappointments along the way. Sometimes an idea on paper doesn’t exactly work in the dye pot. This time I finally achieved a useable result. The fabric is dyed with marigold grown in my garden and madder, plus eco-printed with rose leaves from my front garden. The fabric is 100% cotton and measures 22 inches by 45 inches, so a decent sized piece of fabric to work with. Interestingly, when I unbundled the piece there were tons of little spots that seemed to resist the dyeing and eco-printing in the very centre of the dots. I have no idea what created the dots, but I guess that is the joy of eco-printing, never knowing exactly what the final result will be. This should be an interesting piece to turn into “something” in the coming winter months. Life has been interesting and busy which probably explains why I haven’t been putting out a flurry of blog posts. I have been busy with a bit of photography, continuing to work on the naturally dyed bracelets, updating the website, and an unexpected illustrating project. On Monday I walked into the upstairs bathroom and I just couldn’t take it anymore. It was time for an update. 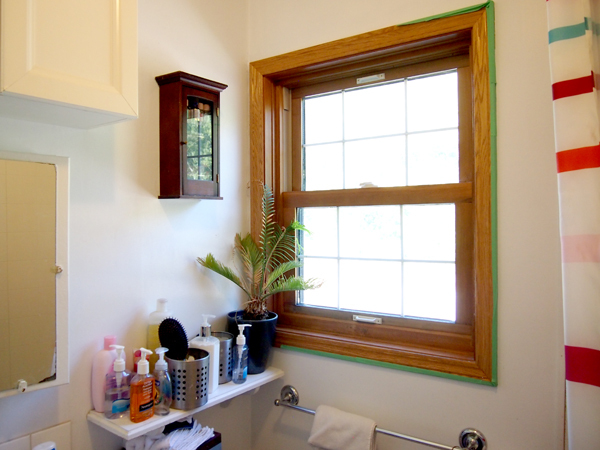 Spontaneous paint jobs and renos are nothing new in our house, sometimes it is something minor like painting an accent wall, while others are more major like a late night decision to take out a wall (true story……..we decided if we put a sledge hammer through the wall we had to commit to the project!). The bathroom was looking very uninspired. Five children create a lot of wear and tear. The plain white looked…well….just plain. The bathroom needed a change. Now the bathroom is a pretty unremarkable space. It is 67 years old and it measures 5.5 feet by 6 feet. The remarkable thing about the bathroom is we managed to get a 5 foot long tub installed in it a few years ago, and even better the tub is 20 inches deep. This tub had to be squeezed through a doorway that is 22.5 inches wide. If you ever want to see a plumber sweat this was the perfect scenario, with only 2.5 inches to spare getting through the doorway and six inches to spare once inside the bathroom. To make things even better, once they managed to get the tub in (and they swore it wouldn’t go) they realized the floor was no where near level; let’s just say this wasn’t the plumber’s best day ever at work. Anyways, back to my $53 update. I decided that maybe we should try a grown up color, but painting all the walls would be just too dark. I decided on painting two of the walls with a shower curtain in a similar, but not matching, tone. The darker color really defines the space and makes it a much nicer space to be in. The bathroom will never be huge, but it is definitely a lot more pleasant. Painting of the lake by our cabin. A relaxing scene to look at while soaking in the bath. If you’d like to check out how the portrait went check out this link. The children really did a great job! I have decided to go for a post of peaceful images of flowers at our cabin for today. My brain needs a little zen at the moment as our weekend did not go as planned. Now when most people say their weekend didn’t go as planned events such as car trouble, bad weather or a change in work schedules usually come to mind; our was different. On Friday night we drove up to our cabin, we had a meeting we wanted to attend on Saturday and thought going up the night before would mean we could sleep in late before heading off to the afternoon meeting. We were awoken just after 7:00 am by a thumping noise, at first we thought “oh no, not squirrels in the attic again”, and then the thumping got louder and louder as if someone was jumping on top of the roof. The cabin was shaking. At that moment my husband shouted “the kids”, ran into their room, and found our eldest in a full-blown seizure on the top bunk bed. Pure panic took hold. My husband shouts “call 911” as he keeps our son as safe as possible. I find the phone, dial the number, at this point our four other children are shrieking hysterically with fear. The thrashing stops, then nothing. Our son is breathing but no response to anything. I am now on the phone to 911, they get the details of our son, I am describing everything, and then they ask for our address. We are at a rural address, it is full of “TWP”‘s and “RD”‘s and numbers, a lot of numbers, especially when you are panicked. My mind races and then I realize the only thing I can do is run down the road and read the sign to the 911 operator. My husband is with our son. Our other children are on the couch screaming thinking their brother will die. I run down the gravel road in bare feet and pajamas to get the address so that we can get help. I finally give the address to the 911 operator, run back down the road, and find our son still isn’t responding but is breathing. The first responders are dispatched. We wait for what seemed an eternity but in fact was about half an hour. The 911 operator talked to us constantly, reassuring us, asking our son’s condition. A few minutes before the ambulance arrived our son started mumbling and moaning with some weird jerky body movements. We start to feel a bit better with this. Our second son had a couple of seizures as a toddler with fevers, and had come out of them fairly quickly compared to what we had just witnessed. A bit of moaning at this point seemed like progress. Just as the first responders entered the cabin our son tried to sit up. My husband said it was uncanny. It was also a huge relief. They checked out our son, took all the vitals, and readied him for transport to the hospital. We arrived at the Stollery Children’s Hospital roughly an hour later. The first responders were brilliant. I can not say enough about how great they were. They waited with us until our son was taken over by the hospital and the fantastic care did not end there. Admission, nurses, doctors, everyone was great. They were pleasant, polite and efficient. Tests done, even a CT scan, and all was done quickly. The hospital was clean, cheerfully decorated and the waiting room was great for our other children as it had video games, an aquarium, toys and TV’s. Four hours later we were relieved to find all the tests had come back normal. We still have follow-up testing to do, but we are blessed that our son seems fine. As you can imagine we are all still a little on edge, at night we can’t help but check on the kids a few extra times, but knock on wood all seems well. We will never again say “Our weekend didn’t go as planned.” when something little, like rain on a camping trip, happens. I have been thinking about eco-printing a shirt for some time. I like the concept of wearing naturally dyed clothing and I love the earthy look and colors. The one thing that was holding me back was how to deal with eco-printing the two sides of pre-made clothing at the same time and still create a visually pleasing item. In the end I decided to stop thinking about it and just try it, after all how hard can it be? I laid out the shirt, wet it down, and sprinkled on the leaves. then it was time for bundling and steaming. This shirt sat bundled for longer than I usually do as life just simply got busy. I am pretty happy with the end results. Okay, to be honest I am very happy with the results and for that reason I am keeping the shirt for myself. Olive green is one of my favorite colors and the shirt is so earthy that I just must keep it. I think the leaf placement worked, and I like how the bundle marks ended up on the back. The details printed beautifully, possibly because the item stayed bundled for so long. I am still amazed at how well rose leaves print. Let me describe today. It is September, the sun is shining, the sky is blue and it is +30 Celsius outside. Fabulous. I’m in the lucky situation where a lot of the art, textile and photography work I do I am actually able to complete in the evening, this means that on a lovely day like today I am not strapped to a desk , computer or work area, but rather have the opportunity to enjoy the last few days of summer. This afternoon we headed to downtown Red Deer. All summer there have been performers at the Ross Street Patio on Thursdays at lunch time. We have been down to listen to the music several times, the music is always good and today was no exception. The music was fabulous; Garrett Olson was an amazing talent. After eating lunch and enjoying the entertainment we decided to do a tour through the gardens at City Hall Park. This park is stunning every single year with flower bed after flower bed of beautiful flowers. We checked out all the blooms. The park was busy with many people enjoying the outdoors as they ate their lunch, read a book or simply sat taking in the atmosphere. Let’s hope this great weather continues a little while longer! I have been working on this piece for a few months now, not solidly but more in bursts here and there. I thought it might be helpful (to myself) to post a W.I.P. (work in progress) post on the piece. A few days ago I took a really good look at the piece and noticed the contrast was weak. It was fine standing a few feet away from the piece, better closeup, but from across the room one element was merging into another and the piece really didn’t grab you. “Rundle” before I worked on the contrast. So I decided to spend the weekend trying to solve the situation. The first step was to add some silk leaves that I “think” were dyed in mountain ash. From here I could start adding some contrast. I decided to do a combination of stitching and beading to add more definition; for the light-colored stitching I used madder dyed cotton, and for the dark stitching it was logwood dyed wool. I wanted to do a combination of stitching and beading and highlights and dark tones to prevent myself from just reaching for the beads. Beading the focal points would have been an easy solution but I wanted to solve the problem without taking the easy way out. This has been a tricky piece right from the start. Before starting the piece I did a quick sketch of what I wanted, I did the sketch from memory and all looked fine…..well that was until I looked at a photograph of Rundle for a reference and realized my sketch was mirror image to what really exists. Weird. So everything had to be flipped around before the needle hit the silk. Even though I have spent many hours working on the image, and the image is now right, it still feels backwards to me. This piece still needs a ton of work. The lower part has barely been touched. Seeing the pictures of the piece on the computer screen is a great help to see what is working and what isn’t. This piece definitely still has many hours to go. Interested in other blogs I write? I also blog at www.islandhomeblog.wordpress.com (sharing island life) and at www.debrahunter.wordpress.com (sharing finished art, fibre and portrait and project photography).